Lady Barbara Judge CBE, an American living in London, has been blazing trails for women since 1969, when she received her B.A. from the University of Pennsylvania and later her Juris Doctor with honors from New York University Law School. After working at a top New York law firm she was appointed as the youngest-ever Commissioner of the U.S. Securities and Exchange Commission by the President of the United States. In 1983 she moved to Hong Kong as the first woman main board executive director of Samuel Montagu & Co. After a long career in banking and then private equity she became a director of the UK Atomic Energy Authority in 2002 and became its chairman in 2004. After completion of two terms as chairman of the UK Atomic Energy Authority, she was named chairman of the UK Pension Protection Fund. Among her other appointments she has been chairman of SOAS (the School of Oriental and Asian Studies at the University of London) and is currently a member of the boards of Bekaert (Belgium), Magna (Canada) and Statoil (Norway). She was the first woman member of the Board of Overseers of the Wharton School and is a Trustee of the Lauder Institute, and a member of its Europe, Middle East and Africa board. She is also currently chairman of the Energy Institute at University College, London and in 2010 was appointed by the British Prime Minister as a UK Business Ambassador. Judge says she never felt quotas were necessary. Until now. “My thinking has evolved,” says Judge, who is usually the first and only woman to be named to the various boards she participates on. “It is a start and I am for it.” She has made it her business, when possible to bring another women on board, but in most cases there are never more than two. After seeing the difference that four women have made to the board of Statoil, which is based in Norway, one of 11 European countries which have established quotas, Judge says she is convinced such action is necessary to ensure the number of women on boards is increased everywhere. It is not happening naturally. “We need one big kick and then the ball will roll in the right direction without any help,” she says. The real issue is that there are not enough women executive directors with P&L responsibility, says Judge. But mandating a greater number of women on boards is a start. "If you don't make a start you won't get to the finish line," she says. The meeting was a follow-up to one convened last March by Reding with top executives at publicly-listed companies to point out the under-representation of women. She challenges the companies to commit voluntarily to increasing women's participation on corporate boards to 30% by 2015 and to 40% by 2020. 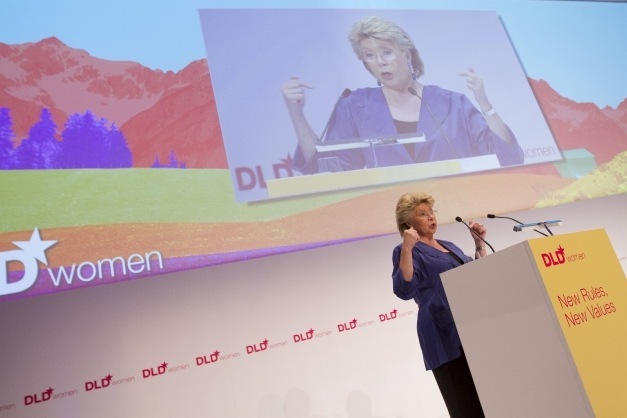 There has been little movement so Reding, a co-chair of DLDwomen, is considering legislation to make adding more women mandatory. While the women who attended the June 19 meeting are highly successful in their careers and have made it onto boards despite the fact that there were no quotas, like Judge many are beginning to think that there ought to be a law. The list, compiled with the help of several other women’s organizations, including London-based Women in Telecoms & Technology (WITT), includes profiles of 300+ women and a pipeline of women graduates from business school. More than 7,000 board-ready women have been identified in total, thus far. Women who attended the June 19th meeting were stunned that invited CEOs of companies and heads of industry associations argued that they were doing the best they can to find qualified women and didn’t seem to get the fact that women have run out of patience, says Johnson. Getting more women into the labor market is an important factor in improving Europe's competitiveness. Having more women in the workforce will also help achieve the EU's goal of raising the employment rate for adults to 75% - a target to which all EU governments have signed up. Eleven EU countries have introduced legally-binding quotas for company boards (Belgium, France, Italy, the Netherlands, Spain, Portugal, Denmark, Finland, Greece, Austria and Slovenia). These varying quota rules are new, and they can be a challenge for businesses operating in several EU countries. So it is better to have a single, uniform rule. Europeans strongly support better gender balance. In a recent Europe-wide opinion poll, 88% of people said that, given the same qualifications and skills, women should be equally represented in top business jobs and 75% said they were in favor of legislative measures to enforce this. A growing number of studies show a link between more women in senior positions and companies’ financial performance. For example, a McKinsey study found that gender-balanced companies have a 56% higher operating profit compared with male-only companies. Ernst & Young looked at the 290 largest publicly-listed companies and found that the earnings in companies with at least one woman on the board were significantly higher than in those that had no female board member. What’s more, companies that have more female executives are more in line with the reality of today’s society — and, as a result, say pundits, are more capable of identifying products and services that make sense for their customers.Indeed, over 80% of consumer purchases in the developed world are made by women but the majority of women feel misunderstood by marketers. If the customer base has new expectations, the talent pool inside corporations needs to reflect these changes, according to report on gender balanced research published by Deutsche Bank. Despite such strong economic arguments, companies are still slow to promote women both in the boardroom and in C-suites. So, even if quotas do become mandatory across Europe it will not be a panacea. “The issue is not at board level, we have an issue all along the chain,” says attorney Thaima Samman, president of Paris-based Women In Leadership, a European networking group which responded to Reding’s public consultation on gender imbalance on corporate boards. Indeed, McKinsey’s Women Matter 2012 report concludes that women’s representation in companies has grown but is lower on executive committees than on boards. (ee chart) Given current growth rates, the proportion of women sitting on Europe’s executive committees will still be less than 20% by 2022, the report says. McKinsey’s research shows that although many —but not all – companies now recruit their fair share of women, women become increasingly under-represented as they move higher up the organization. “The odds are consistently stacked against women climbing higher at every step of the career ladder – not just the top,” the report says. When she told her 20-year-old daughter that she now thinks quotas are necessary her daughter argued that women should rise on their own merits.